Every year, The American Bear Association organizes photographic workshops from May-August, which take place on the grounds of the Vince Shute Wildlife Sanctuary. Photographers who wish to hold their own workshops at the VSWS should get in contact with the office by phone or email for prices and availability. The Vince Shute Wildlife Sanctuary is 500+ acres of North Woods habitat, ideal for black bears and other wildlife. Vince Shute habituated generations of bears frequenting the Sanctuary unintentionally, as he tried to find a way to peacefully coexist with his forest neighbors. Vince fed the bears for more than 25 years. The feeding continues today as a means of preserving the extraordinary opportunities this unique situation provides. 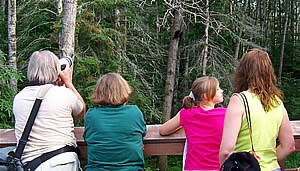 It allows The American Bear Association to educate the visiting public about the natural history of the American black bear and all natural resources. In addition, it allows The American Bear Association to offer you the chance to photograph this normally shy and reclusive animal. Eric will discuss the history of VSWS, its bears, and what to look for when framing each shot. Emphasis will be placing photographers in the right position to get that award winning shot. All instruction will occur in the field to give each photographer as much time as possible with the bears. Each session will provide the photographer with ample opportunity to capture; cubs scampering up a tree, sleeping in a branch, mothers defending cubs, boars vying for position, cooling off in the pond or resting on wood chips. Most photographers shoot more than they expect so please bring memory cards and batteries as well as additional bodies and lenses so you can the most flexibility while shooting at the sanctuary. Tripods are allowed although monopods have proven to be the easiest to use in the field. YOU MUST BE 18 YEARS OR OLDER TO REGISTER. ID REQUIRED UPON ARRIVAL IF REQUESTED BY STAFF. $750 per person for all photo workshops and a membership to the American Bear Association is highly recommended. We also politely ask, although not required, that each photographer donate at least one royalty free photo to the ABA for their use for monetary gains, marketing and promotions and this in-kind donation will help keep the facilities in operation. See below for membership details, benefits and also cancellations policies. ONLINE BOOKING FOR THE 2019 SEASON WILL BEGIN ON DECEMBER 1ST. Please fill in our online reservation form or call the American Bear Association at (218) 757-0172 and leave a message or email bears@americanbear.org with any questions. Reserve a 2019 private photo session or check availability. Videographers looking for a private reservation are required to contact us directly. Friday Night: Participants will assemble for registration, introductions and bear safety instructions at 7pm. Eric will provide a brief discussion about what to anticipate over the weekend and answer questions. Attendance for this meeting is mandatory and waivers must be signed in order to shoot at the sanctuary. Saturday, Sunday and Monday: We will shoot early in the morning and later in the afternoon when the bears are active and we have the best light. Mid-day there will be optional trips to shoot birds on Pelican lake or waterfalls in the surrounding area. The VSWS is closed to the public on Saturday and Sunday morning as well as all day on Monday, so you will be the only guests! Eric is a wildlife photographer, having visited VSWS since 2000 capturing over 100,000 images of the bears. His photo credits include: Sierra Club, ESPN and various regional and local publications. Eric has shot extensively throughout North and Central America focusing on bears and wolves. Eric’s has studied the North American Black Bear extensively and utilizes his understanding of bears, and specifically bears at VSWS, to help his students take better photographs. Travel Highway 53 north from Duluth, MN approximately two hours. One mile south of Orr, turn left (west) onto County Road 23. Grey Wolf Lodge is located approximately 6 miles down CR 23, while the VSWS is an additional 7 miles west on the same road. YOU MUST BE 18 YEARS OR OLDER TO REGISTER AND ATTEND THE WORKSHOP. ID REQUIRED UPON ARRIVAL IF REQUESTED BY STAFF. Questions? Call (218) 757-0172 or email us. You must notify ABA with a written request (by email or US mail with confirmation from ABA) 60 days before the workshop date for a full refund. Any cancellations within 60 days of the event will not be accepted and will be processed as a donation. Thank you. Simply include your dues in the space provided on the registration form and pay the member’s only price for this workshop. The American Bear Association is a Minnesota based nonprofit 501(c)(3) organization. All support comes from the private sector through annual dues, visitor donations, merchandise sales and photography fees. The American Bear Association receives no federal or state support. Contributions are tax deductible to the full extent of federal and state law.